What's New for the 2018 GMC Savana? 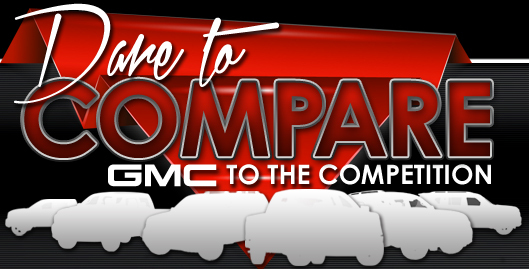 In 2018, the GMC Savana comes in three different body styles, which are a cargo van, an extended cargo van, and a passenger van. All three trim levels are roomier, more spacious, and safer than what was offered in the 2017 Savana and earlier models. The 2018 vehicles are also outfitted with a panel of tech features to make driving safer and more enjoyable, including OnStar. The GMC Savana comes with rear-wheel drive, and it is available with four types of engines. The 2018 Savana's list of standard bonuses includes a tire pressure monitoring system, an oil monitoring system, air conditioning, power-operated windows and doors, and a rearview mirror with a backup camera. 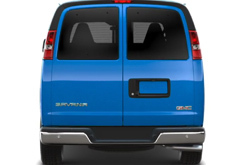 The GMC Savana breaks down into two trim levels, which are the cargo and passenger vans. The cargo van is produced in both a regular and an extended cab version. The regular-length cargo van has an AM/FM stereo with an MP3 player and an auxiliary jack that can connect to multiple media devices. There are two speakers located in the front of the vehicle for enhanced surround sound. The seats are made of vinyl with the option to upgrade to cloth, and they offer support and comfort with a headrest and armrests. Air conditioning, a full instrument panel with a fuel gauge, engine and oil temperature, voltmeter, and a trip odometer are other standard components of this cargo van. This model also features an engine cover and a storage bin. 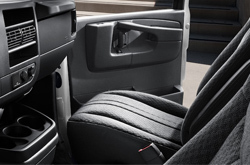 The cargo van has multiple cup holders in the front and back and two 12-volt power outlets. A 4G Wi-Fi connection is an option for those who want to use internet while on the road. This model has a towing capacity of 8,600 lbs when properly equipped. The extended cab has the same standard amenities and optional features as the regular-length cab. At 244.1 inches, it's 20 inches longer than the regular cab, and it has a higher maximum payload of 3,022 lbs compared to the regular cab's maximum of 3,353 lbs. 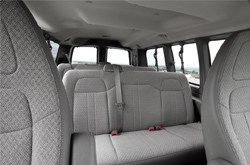 The GMC Savana passenger van seats up to 15 occupants. It is made in two trims, which are the base LS and the higher-level LT. Like the cargo van, both passenger van trim levels are made in a standard and extended version. The 2018 GMC Savana Passenger is produced with a base 4.3L, six-cylinder engine, which can be replaced with a six-liter V8 engine or a turbo-charged four-cylinder diesel engine. A rearview camera is integral to both trim levels. The LS has vinyl seats while the LT has cloth seats. The base GMC Savana engine is a 4.3L, six-cylinder engine that is paired with an eight-speed automatic transmission. This engine can produce 276HP and 298LB-FT of torque. There are two variants of V8 engine available, which are the 6.0L Vortec and the 6.0L Gaseous LPG/CNG. Both the Vortec and Gaseous engines have a maximum 341HP and 373 LB-FT of torque. The last engine is the 3.6L Duramax turbo-charged diesel engine, which produces a maximum of 181HP and 369 LB-FT of torque. Other mechanical amenities of the 2018 Savana are a stainless steel muffler and tailpipe, a transmission oil cooler, and a stability control system. The GMC Savana has an independent front and rear suspension that make for a smooth, safe, and comfortable ride with coil springs and a stabilizer bar. A six-speed automatic, heavy-duty transmission with electronically controlled overdrive, cruise grade braking, and powertrain grade braking, is available on all versions of the 2018 Savana. 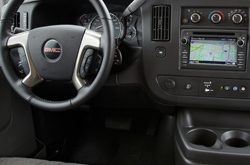 Inside and out, the GMC Savana comes with a notable list of safety features. A rearview mirror with a backup camera is standard in all trim levels. All are made with front and side passenger airbags, and there is an airbag deactivation switch that can signal the airbags not to deploy when seats are unoccupied. Daytime running lights, child-resistant locks, and steel reinforcement around the passenger doors are other notable standard safety features of the 2018 Savana. Rear parking assistance and a horn are optional amenities.